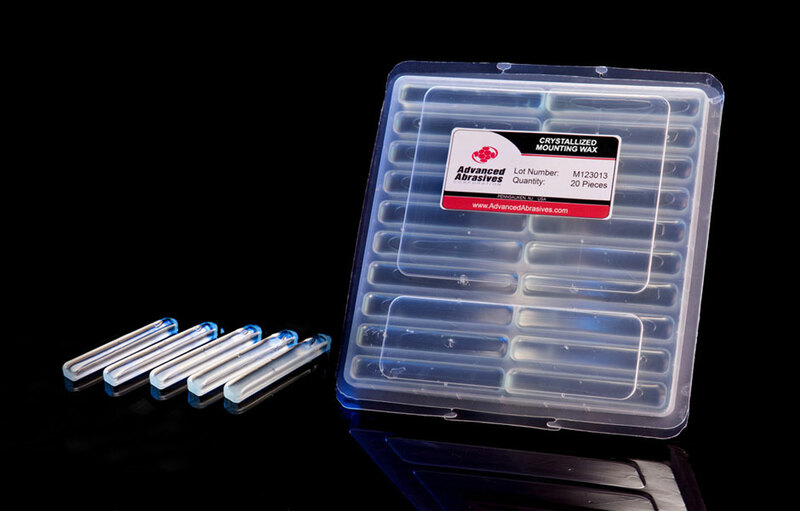 Premamount Crystallized Wax is primarily used for the temporary mounting of semiconductor wafers for dicing or grinding. It is also used in mounting ceramics, ferrites, optical lenses and gemstones for grinding or other machining operations. It is resistant to most common solvents including water. Premamount Crystallized Wax is a clear solid at room temperature and starts to soften at 71-77C (160-170F) and has a viscosity of 6000 c.p. at 120C (250F). As long as the temperature remains above 60C work pieces may be moved or positioned. After a few minutes at room temperature, the adhesive will set and machining can begin. This product is not recommended for vacuum applications. While acetone is by far the most effective solvent for this wax, some customers have also used methylene chloride with 8 per cent methanol. Naturally, an ultrasonic bath helps to remove the adhesive. Premamount Crystallized Wax is available in 7/8 inch diameter by 7 inch long glassine line tubes, or in 3-1/2 inch or 7 inch cast bars.